Antares is an Iroquois MkIIA Sailing catamaran designed by Rod McAlpine-Downey. This one was built in 1971 and has sail number 289. We spent most summer weekends sailing the Solent and adjacent waters. In years past we have cruised the west country, Normandy and northern France. and a website with loads of information run by the Iroquois Owners Association. Sadly, Antares was sold in April 2003, she set sail from Portsmouth and, before getting to her initial destination of Lymington, capsized off Lepe in the Solent. She was double reefed in 20 - 25 Knots of wind and shouldn't have been overpressed by the wind. My current theory is that she was hit by the wash from one of the fast cats plying between Cowes and Southampton, being pushed sideways, she probably tripped over her leeboard. The crew, remarkably and due in no small measure to their preparedness and knowledge of the correct procedure, then survived for 12 night hours on the upturned hull. They were finally spotted from shore and eventually taken off by the Calshot lifeboat crew. Antares was later towed back to a buoy off Calshot. 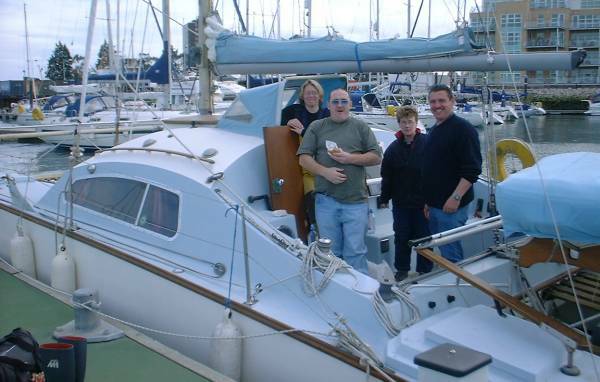 This is Tom and his crew, just before leaving Portsmouth on a windy day, heading home. June 2003 Antares was righted by members of the lifeboat crew at Calshot. She looked a very sorry sight covered in weed that had grown over her, holes in the cabin top and windows smashed. She has now been bought and towed round to Port Solent where she was lifted ashore. The new owner is reckoning on a two year project to bring Antares back to life.